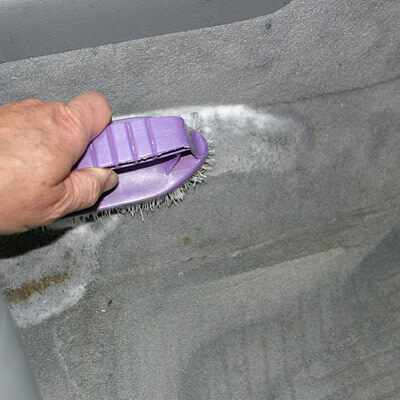 » How to clean your car’s interior? 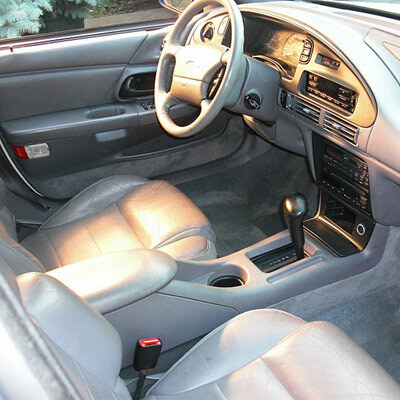 How to clean your car’s interior? Most people spend a significant amount of time in their vehicles. 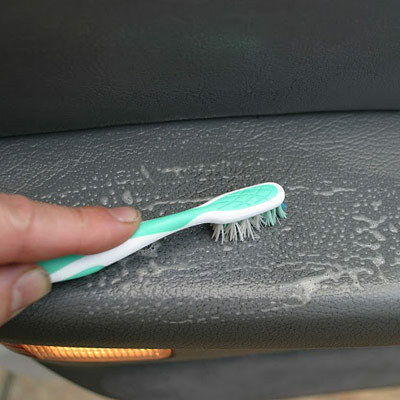 If you are one those that basically live in your car and, especially those with kids, you know how dirty your car can get. 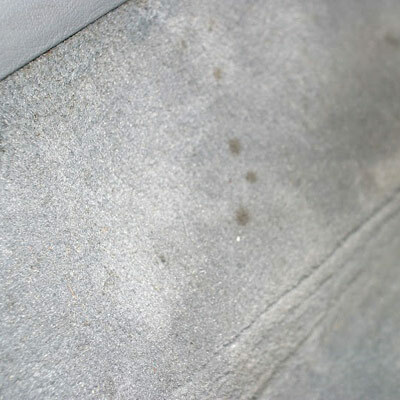 Follow along as we show, in obsessive detail, how to clean common automotive fabrics and stains. If you know of any good tricks, please comment below. 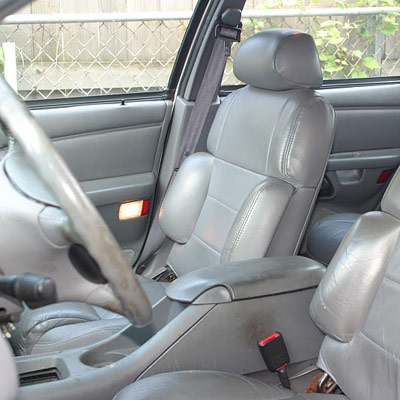 Some cars with leather interiors only have leather seating surfaces. Others have leather in locations other than just the seats. Because cows don’t come in green and blue, Leather interior colors have to be custom dyed to match. The dye can wear off but it is possible to restore thin areas if it’s not too bad. 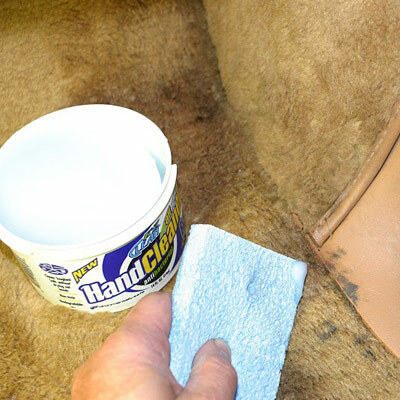 Leather requires special cleaners and conditioners to keep the leather supple and soft. 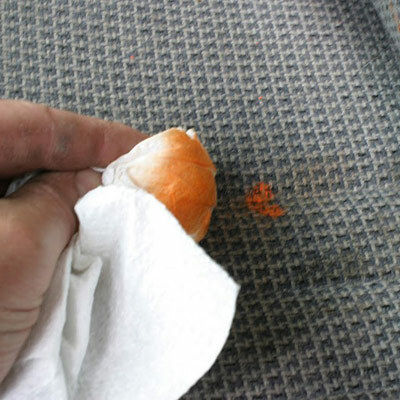 If the leather cracks or wears out, then it may be time for new seat covers. This car is in fairly good shape for being 15 years old but could use some cleaning. 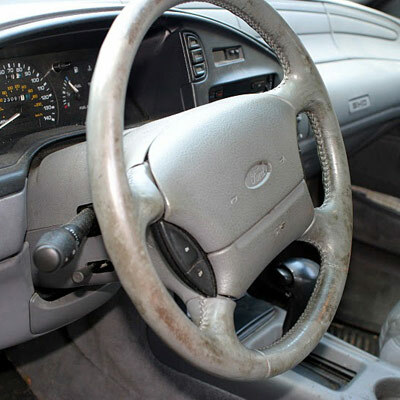 The leather wrapped steering wheel has seen a lot of use. The dye is worn through in spots and the wheel is quite dirty. 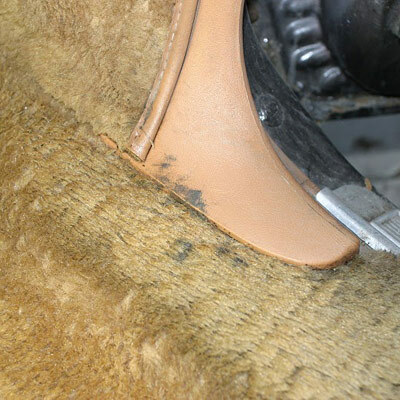 The leather is sewn on so it is very important not to damage the threads or the outer covering will come off. 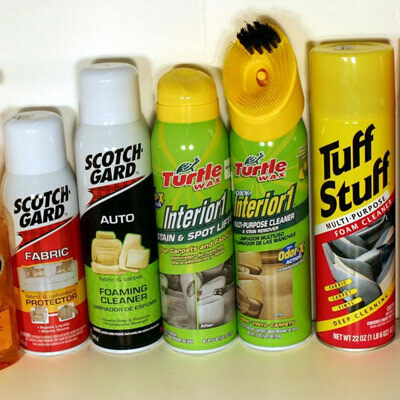 There are many types and brands of interior cleaning products. Depending on the material you are cleaning, you may need several products. For the leather portions, I used Zymol leather cleaner. 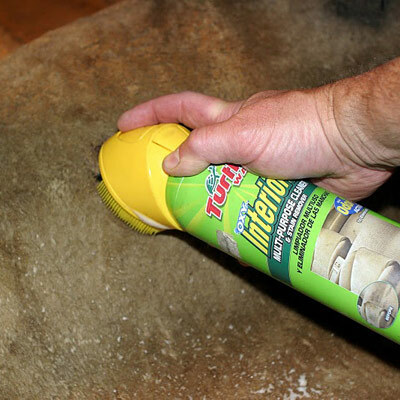 For the carpet I tried out Turtle wax spot lifter and remover. 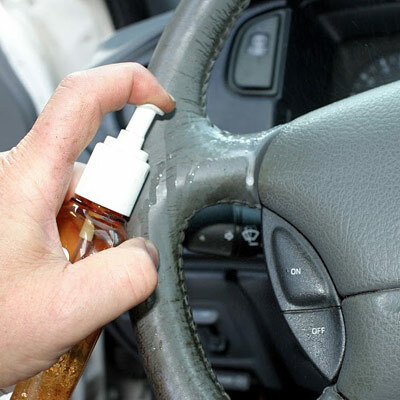 All the products had a warning to first “try it in an inconspicuous place” to see it was compatible with your car. 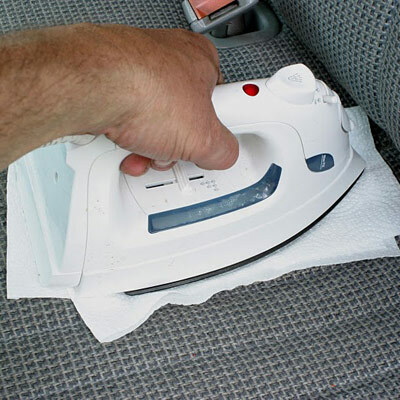 Most car interiors are made with a robust material, but it’s best to be safe than sorry. 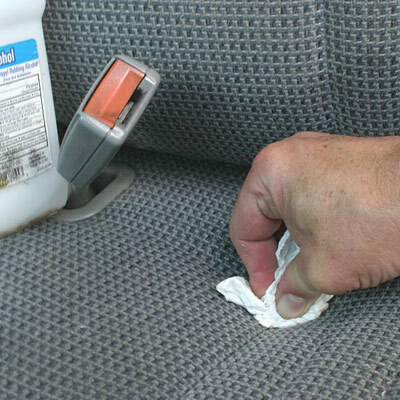 Spray the leather cleaner directly or onto a clean, soft cloth. Terry cloth or an old cotton sock works well. I keep a bag with discarded, clean sweat socks and old “tighty-whities” cut up into rags. Wipe the dirty area until clean. Do not scrub too hard or you might clean right through the color. 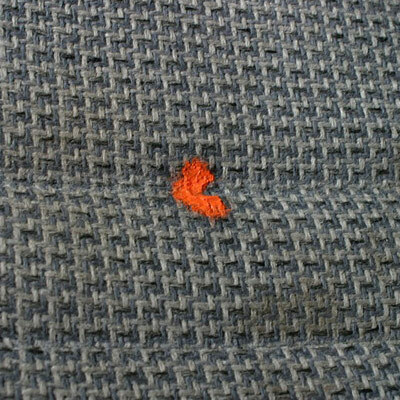 If it looks like it’s not cleaning, you may be working on an already worn through spot. I may show leather dyeing in a future DYI article. 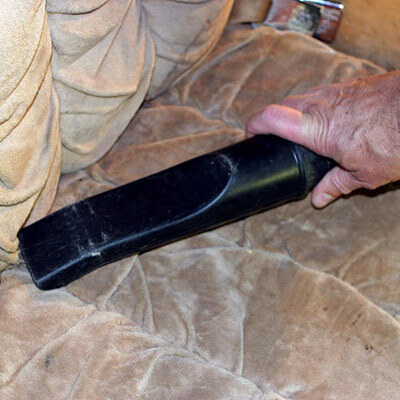 Some crevices can’t be cleaned easily with a cloth. 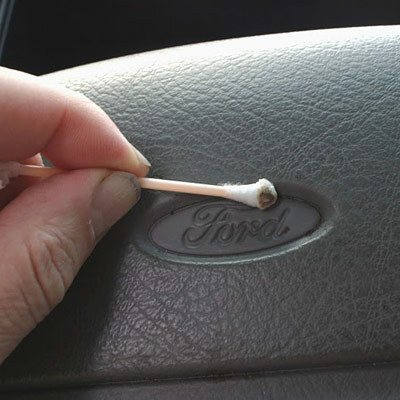 Keep a bag of Q-tips handy for these spots. You’ll be amazed at how much better the car looks when you clean all the detail spots. I guess that’s why they call it detailing. working on an already worn through spot. I may show leather dyeing in a future DYI article. Dirt can hide in between the leather grain. Use a soft bristle tooth brush in a slow, circular direction. You get extra, perfectionist points if you use a new toothbrush on your car. You lose points if you use your spouses toothbrush and then put it back. 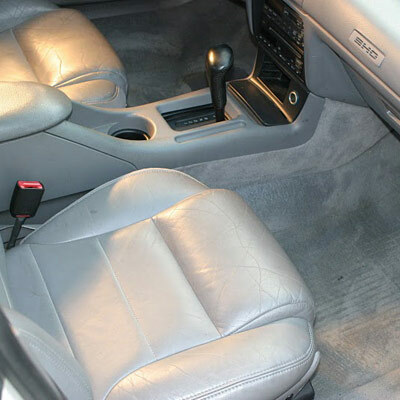 You can’t have a clean interior if you forget about the carpet. Spots and stains like these need special attention. First vacuum the carpet to pick up all the loose dirt and french fries. Spray the spots with the stain lifter. You’ll want to really soak them. Scrub the dirtiest spots with a plastic bristle brush. You may have to repeat the application on stubborn spots. 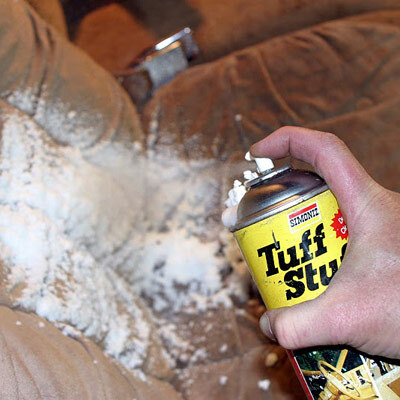 Wipe up the lifted residue with a clean cloth. Vacuum the carpet again after the cleaner dries. Step 14: Glass Cleaner Works! Glass cleaner works on interior plastic as well as the windows. Whistle a happy tune as you use paper towels or cotton swabs to excise all that nasty dirt. All Done! 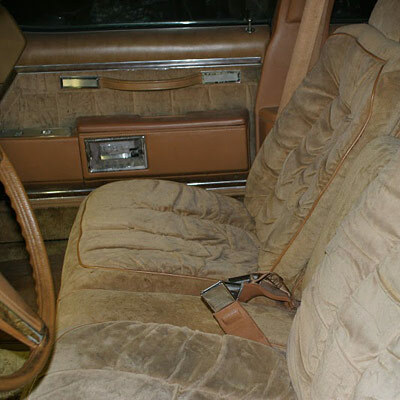 This old car’s leather interior looks much better now! Now we’ll try cleaning cloth seats. Here’s our next test subject. 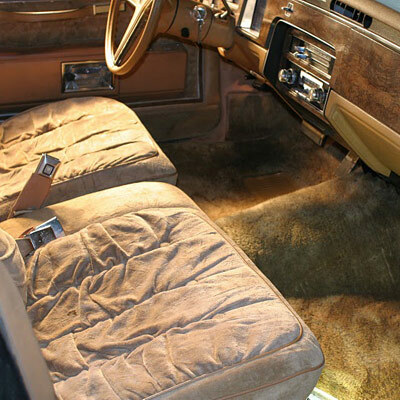 A 1979 Pontiac Bonneville with a soft, fluffy velour interior. It is in good shape for being so old, but the inside hasn’t been cleaned since the last century. Cleaning cloth is much like cleaning carpet. First vacuum out all the dirt and loose debris. You don’t want to scrub around any embedded abrasive particles and ruin the cloth. 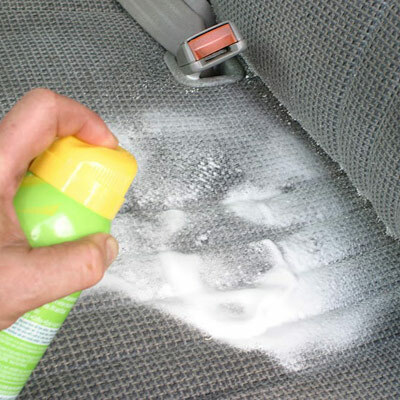 Spray the foaming interior cleaner on the seats. 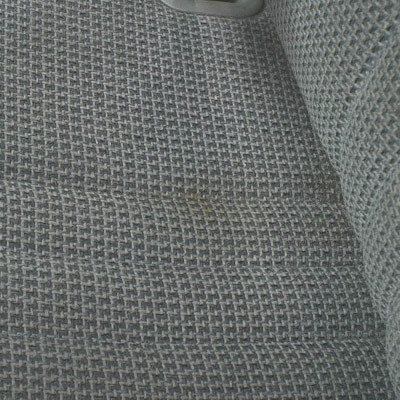 This particular cleaner was compatible with velour but will work with any cloth interior. 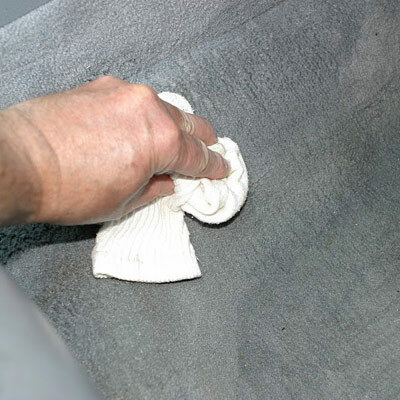 Wipe with a wet sponge, then use a clean soft cloth to wipe up residue. Allow to dry. 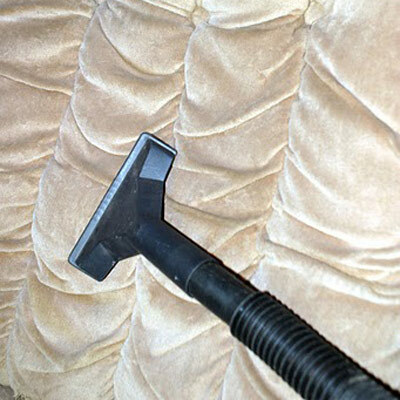 Vacuum cloth clean. This will also restore the “fluff” of velour. Grease and road tar can get into your car by way of your shoes. I found mechanic’s hand cleaner works well on these stains. Don’t use the kind with pumice. I found this biodegradable cleaner at Lowes. This carpet cleaner has a handy built in scrubber. It worked well to get non-greasy stains out of carpet. Thirty two years old, all cleaned up and nowhere to go but back under the car cover. If you aren’t “child-free” then this is not an unusual sight. 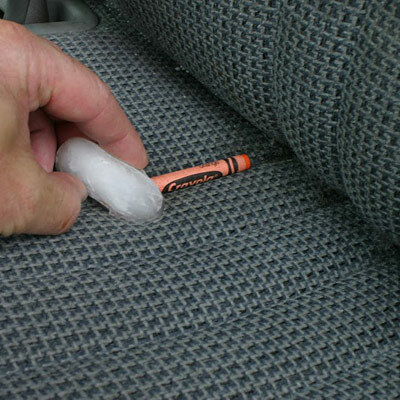 Crayons, gum and hard candy all become sticky messes when left in a hot car. First aid is to first stop the melting. Apply an ice cube as soon as possible. After it re-hardens remove as much as possible. 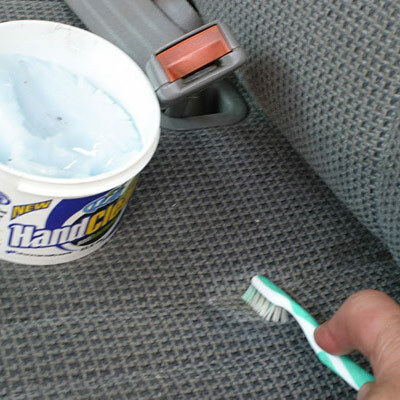 This works also on gum. My initial attempt without using ice. A large melted glob soaked into the cloth. I tried the “iron on paper towel” trick. The heat remelted the crayon and it soaked into the paper towel. This still left a stain and rubbing the hot wax spread it around. Take it from me. Don’t rub the melted crayon around. Be careful with the amount of heat so you don’t burn the cloth or melt the foam underneath. Repeated blotting with a clean paper towel soaked up most of the excess crayon residue. Key word is “most”. I wanted it all gone. 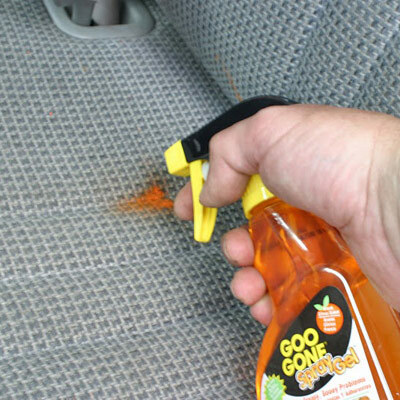 I then tried ‘Goo-Gone’. 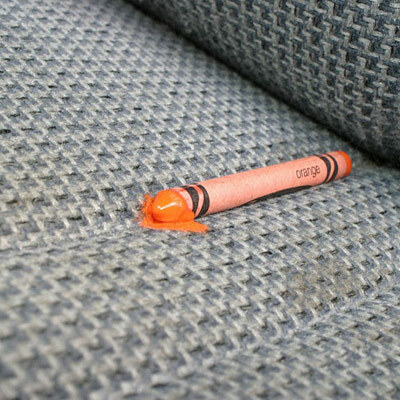 This diminished the bulk of the crayon but didn’t remove the stain color entirely. Mechanics hand cleaner was more effective. A little finger sized dollop rubbed in with a soft bristle tooth brush worked very well. Clean up the hand cleaner with Isopropyl Alcohol. Blot with paper towels. Apply pressure so it soaks up the liquid with the dissolved color. Repeat until no more color shows up on the paper towel. Final clean the cloth seats with the same technique as shown for velour. Spray on cleaning foam, wipe clean, let dry and vacuum. Regular shaving cream also works in a pinch. 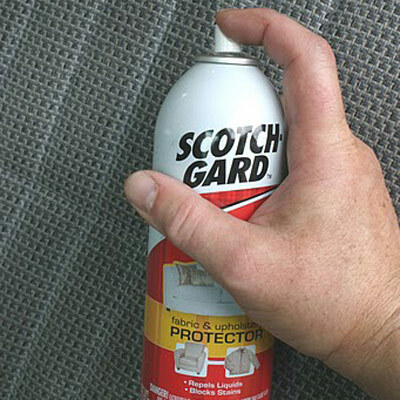 To help make clean up easier for the inevitable future stains, spray your cleaned fabric with Scotch Guard. Just follow the directions on the can. To protect your carpet, I’m a big fan of McNeil custom fit floor mats. 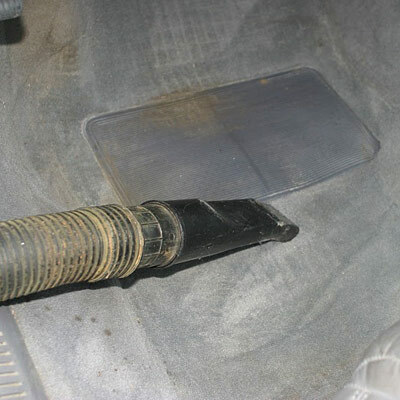 These are sturdy American made mats and will save you from a lot of carpet cleaning. 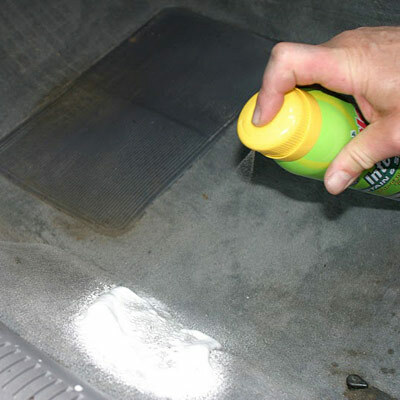 They also keep winter boot drips from turning your floor boards into a ‘Flintstone’ mobile. 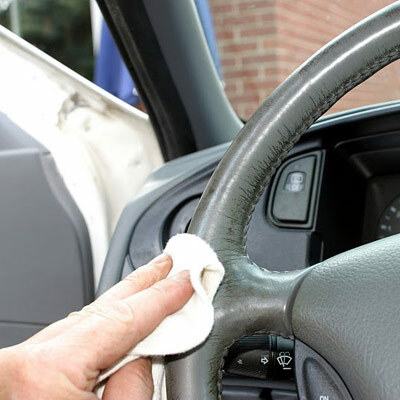 Don’t forget to post your favorite car cleaning tips in the comments section below. Why you should wash your car? The Evolution of the Car Washing Industry. It’s been that way since we opened over 10 years ago. 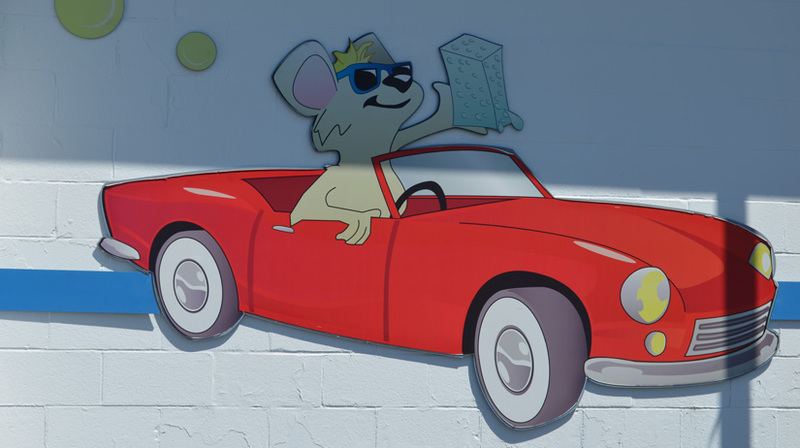 Our commitment to bring out the best in your car’s appearance shows in everything we do, from the high-quality biodegradable soaps and waxes, to the carefully selected equipment in our professionally designed tunnel. © 2016 Squeaky Clean Car Wash | ALL RIGHTS RESERVED.